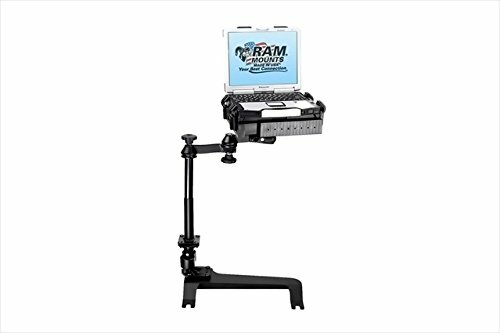 Ram Mounting VB159SW1 Laptop Mount, Chevy 07-13 by Ram Mounting at Tobby News. MPN: R1H-VB159SW1. Hurry! Limited time offer. Offer valid only while supplies last. No-Drill Laptop Stand System installs quickly and easily into the specified vehicles using the existing hardware of the passenger side seat rails. No-Drill Laptop Stand System installs quickly and easily into the specified vehicles using the existing hardware of the passenger side seat rails. This configuration provides a telescoping feature that ranges from 12 to 18 Inches. Dual swing arms provide articulation and 12 inches of reach for passenger and driver access to the mounted device. Patented rubber ball and socket joint provides additional adjustment as well as shock and vibration isolation. The RAM Tough Tray is spring loaded to accommodate 10 Inch to 16 Inch wide laptops And 17 Inch wide screens. The tray features four adjustable retaining arms with rubber grip feature. These arms can be moved both vertically and horizontally. This allows for a custom fit for varying thicknesses of laptops and the freedom of not blocking ports or drives. Hole patterns on perimeter of tray facilitate the mounting of additional RAM systems to support GPS or other electronics.Features. Mount - Passenger Side Floor Mount.. Movement Type - Pivoting.. Finish - Powder Coated.. Color - Black.. Material - High Strength Composite.Fits. 2007-2013 Chevrolet Avalanche.. 2007-2013 Chevrolet Silverado 1500.. 2007-2007 Chevrolet Silverado 1500 HD.. 2007-2014 Chevrolet Silverado 2500 HD.. 2007-2014 Chevrolet Silverado 3500 HD.. 2007-2014 Chevrolet Suburban 1500.. 2007-2013 Chevrolet Suburban 2500.. 2007-2014 Chevrolet Tahoe.. 2007-2013 GMC Sierra 1500.. 2007-2007 GMC Sierra 1500 HD.. 2007-2014 GMC Sierra 2500 HD.. 2007-2014 GMC Sierra 3500 HD.. 2007-2014 GMC Yukon.. 2006-2010 Hummer H3. Mount - Passenger Side Floor Mount. If you have any questions about this product by Ram Mounting, contact us by completing and submitting the form below. If you are looking for a specif part number, please include it with your message.